I will agree that it isn't that big of a cheat and doesn't give that big of an advantage as it is all down to RNG. But it's still something that gives an advantage in battle. My point being that if this is allowed to go through, then what's next on the list? XVM? Aimbotting? Can you post the link, especially if it is official info, please. unkindest - I do not follow your logic at all. Of course additional info provides advantage, even if not fully precise and random factors are involved. These either should not be allowed, or made option within the game. I would prefer the option (I guess), but feel that some people using them at the moment is pure cheating. Just learn where the ammo rack is on the IS7,3,defender etc.....all you need to know to feel really happy !!! Even an ammorack on a Bt-7 arty gives joy. Cheating to do so would diminish the joy, so why bother? then what's next on the list? XVM? On WoT PC there is built in support for mods that isn't just replacing files, i.e you can write code to make stuff appear ( like xvm). We already have a bigger cheat than that. It's the built-in highlighted armor feature, showing everybody exactly where to shoot. What advantage would module drawings possibly give you in comparison? 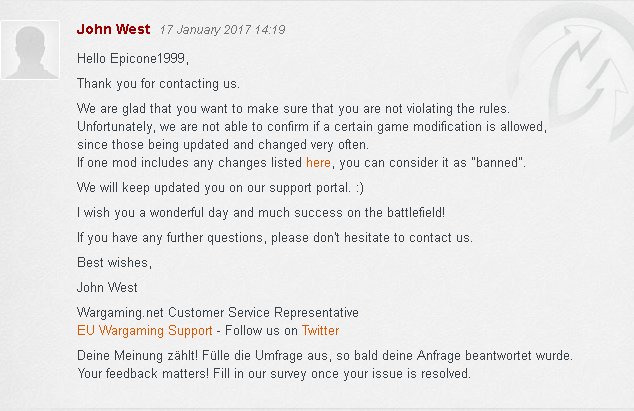 People can damage your modules? I'm not worried, i carry repair kits. Edited by HughDomfok, 18 January 2017 - 08:05 AM. Well...if you are facing a big caliber gun and this guy uses the hit skin mod.... You are pretty much vuked. As we all know high calliber guns get ammo rack shots more often. Also tanks like Helsing which shoot twice have advantage with that hit skin mod.